With everything so high-tech and screen-based these days sometimes it feels nice to use a real, mechanical keyboard. Thankfully, Cooler Master has developed a new compact keyboard that you can take with you anywhere. Due out later this year or early in 2019, the CK620 is thin and light. It is approximately 60% of the size of a full keyboard and will fit in any purse or carrying case easily. 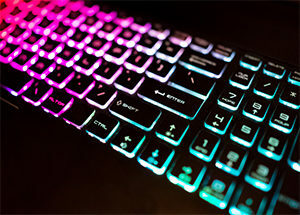 The keys light up in groups of color using RGB LEDs, that add to the features of great feel, texture, and snappiness of the mechanical buttons. The CK620 uses Cherry red switches. Gamers will recognize those as super-responsive keys that are also 35% thinner for a low-profile, high-tech feel. When it hits the market, the CK620 will be available in both wired and Bluetooth/USB models. Users can expect about 5 hours of battery life with the colored lights on and much more with them off. So far, no price point has been announced.